The components of our free-standing awnings are custom welded to ensure a flawless seal between them and the framework. Our Tempo is a free-standing, double-sided retractable awning. This system can be installed over sidewalks, terraces, patios or decks. It is so versatile that the Tempo double-sided awning can be used at home or at your business establishment. Made to withstand the elements, the Tempo free-standing awning’s support structure has a high grade powder coat cured onto a galvanized steel frame protecting it from rust, flaking and corrosion. 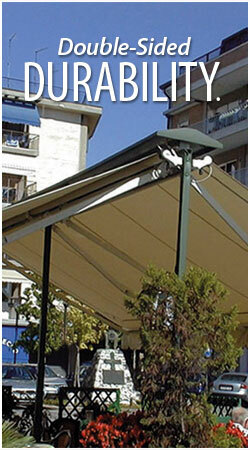 Stationary awnings can be made into freestanding awnings with the proper mounting.